Next to Normal is a show that I’ve taken my sweet time to get around to seeing. Not unlike a Pulitzer Prize voter, I’ve put it off always feeling that there were better or more pressing options available to me at the times I was free to go. Maybe the subject matter was a little too close to home or my professional life. Well, the show with music by Tom Kitt and a book and lyrics by Brian Yorkey opened up its national tour in Los Angeles recently and with the show at my doorstep, I went. And while I won’t be casting a write in vote against more deserving works the next day, I will say I regret not seeing Next to Normal sooner. It’s a fascinating and frankly brave show that pushes forward even in a theater world long used to dark and unusual material at the center of its musical theater. The story concerns an American family in its latest state of unraveling over the long-standing mental illness of its matriarch, Diana, who is played here by the actor who originated the role on Broadway, Alice Ripley. She’s excellent right down to the fractured quality of her voice and manages to stand out in a good way in the midst of a show with strength after strength. It’s best to go into this show with as little information as possible since many of its twists involve the revelations of the family’s shared history, which is known to all the show’s characters from square one but the audience is only made privy to bit by bit. The rest of the cast in this touring production is quite good and no one comes off as hammy or phony. I was particularly fond of Curt Hansen as Gabe, the son, and Asa Somers as Dan, Diana’s husband. But perhaps the most rewarding aspects of the evening are the look and sound of it all. The scenic design by Mark Wendland under the direction of Michael Greif is sharp, attractive, and ultimately very powerful. The three story scaffolding set initially looks like not much of anything, but Kevin Adam’s lighting design and the judicious use of half-tone graphics create constantly changing and visually arresting images. But all of this would mean nothing without an extremely strong score. Kitt and Yorkey managed a largely sung-through evening that is both catchy and fresh. It’s never precious or cute, but can be very affecting at times. Most remarkable of al,l though, is how the show stares right into the heart of mental illness in an American family and doesn’t flinch. There’s no witty cynicism or easy platitudes here. Instead these are lives that are recognizable as ones we might know ourselves. The portrayal of people suffering with mental illness, their families, and the professionals they work with has a truer ring than most people would like to admit. 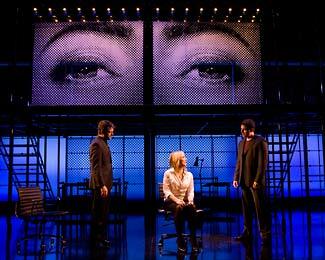 But Next to Normal is eminently watchable and one very satisfying evening of musical theater. It may not sound like holiday fare, but it’s probably the best show you can see in Los Angeles over the holidays. Next to Normal runs at the Ahmanson Theater through January 2.